Strong filament fibers for extra-heavy binding. Super-adhesive action for maximum gripping power - needs no water. 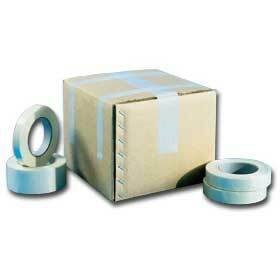 Where extra strength is needed, use this super-tough filament tape. Ideal for heavy boxes, lumber, steel, tubing or even for emergency repair work. Keep a handy supply around your shipping dept., or maintenance area. Applies easily with durable metal dispenser. FOB Shipping Point. Please order case quantites only.